One day after a Russian Mars probe was left stranded in low Earth orbit, engineers planned to begin trying to save the mission Wednesday in hopes the problem was a relatively simple software glitch. After launching from the Baikonur Cosmodrome on Tuesday, the 29,000-pound Phobos-Grunt spacecraft entered an orbit with a low point of 128 miles and a high point of 216 miles. But the craft's propulsion unit was supposed to fire twice later Tuesday night to raise its altitude and inject the probe on a trajectory toward Mars. Neither firing occurred, leaving Phobos-Grunt stuck in orbit. Phobos-Grunt was orbiting out of range of Russian ground stations for most of Wednesday, but its flight path was expected to pass over Russia again beginning around 1900 GMT (2 p.m. EST). Only then can Russian engineers begin to diagnose what caused Tuesday's post-launch problems. Officials are hopeful they can trace the anomaly to a software issue that could be solved with a reboot or patch. Top Russian space managers said a hardware problem would pose more dire consequences for the $163 million mission, according to news reports. Vladimir Popovkin, head of the Russian space agency, said the engine firing mishap could have been caused by a problem in the orientation of the spacecraft or the probe's computer may not have sent an ignition command on time. Otherwise, the spacecraft was stable and in a known orbit, according to Russian officials. It was unclear if control teams would upload commands for the engine burns Wednesday night, or if the next attempt to set course for Mars would wait until another day. The Russian space agency said they have two weeks to issue the commands based on the spacecraft's orbital altitude and its energy supply. The timeframe is different than the one initially stated by Popovkin, who said engineers have three days to save the mission. If Russia is unable to save the mission, the spacecraft would be subject to atmospheric drag, lowering its altitude until it fell back to Earth. Phobos-Grunt is more massive than NASA's Upper Atmospheric Research Satellite, which re-entered Earth's atmosphere in late September. The highly-publicized re-entry, which had a 1-in-3,200 chance of striking a person, occurred over the Pacific Ocean. A German scientific satellite fell to Earth in October with no reports of damage to property. 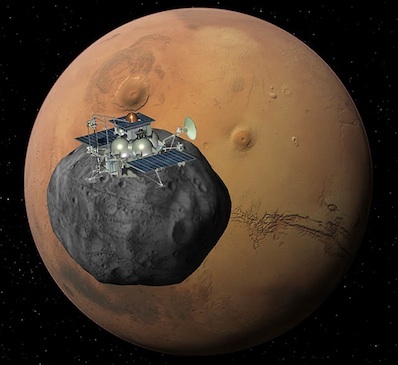 Phobos-Grunt still carries a full load of toxic hydrazine and nitrogen tetroxide propellant to reach Mars and enter orbit around the Red Planet. The propellant potentially makes Phobos-Grunt a greater threat to the public than either recent re-entry or the USA-193 spy satellite that was shot down by U.S. missile in 2008 to avoid an uncontrolled fall back to Earth. U.S. government officials cited frozen hydrazine fuel in USA-193's fuel tanks as the reason to worry about the satellite's uncontrolled re-entry, leading the Bush administration to shoot down the spacecraft before it could naturally decay from orbit. Russian officials quoted in the RIA Novosti news agency said Phobos-Grunt could remain in orbit for up to a month without a risk of falling. 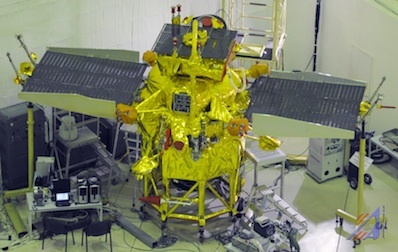 The Phobos-Grunt propulsion system is derived from the Fregat upper stage, a hydrazine-fueled space tug that often places satellites in high-altitude orbits above Earth.